We have clients in Cape Town (incl. Bellville and Durbanville), Johannesburg and Pretoria. We've even done work for clients in London and Vancouver, so contact us now. If you're looking for a caricature artist, go to our caricatures page. Caricatures are basically cartoons of people, in such a way that it resembles them, while distorting stand-out features. 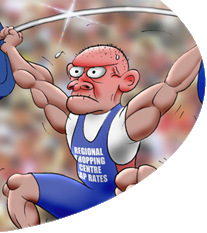 Cape Town cartoonist Konrad Rode often creates cartoons for publication covers, book covers, training programmes and educational programmes. He's been drawing cartoons since age 6, and was strongly influenced by the adventures of Asterix and Obelix, as you can see by his style. Konrad still remembers how he'd say good morning to his parents in bed, with a pretend-newspaper that had comic strips in the back. The client, Rode & Associates is an authority on property economics in South Africa, and Rode's Retail Report is one of their quarterly reports on South African property economics. Most illustrations Konrad does for these research publications are in some way computer-aided, lending them a smoother, more professional feel to complement Rode's revamped corporate identity. We often use cartoons to add some humour to the sometimes morbid subject of economics, something that's appreciated by business people who grow tired of hearing bad news. This one is probably Konrad's all time favourite cartoon (in his portfolio). The most satisfying cartoons are the ones where he gets to make fun of people, and this one was easy. As a cartoonist, Konrad reserves the right to do that, see? The headline for this edition of Rode's Retail Report read, "Capitalization rates continue to strengthen." Cartoon for Sea Harvest "Monks greeting"